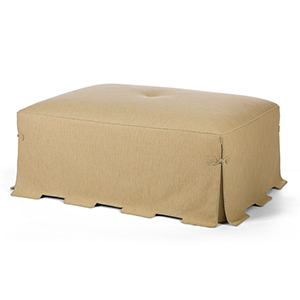 This unique Greek Key Ottoman makes a stylish statement when used as a coffee table or tucked under a console table. The embodiment of function and style! The decorative trim Scrolls, made from your own trim, and hand applied at the corners are a defining detail. Tight mitered seat with pull stitch in center. Handsewn skirt outlined with welt and draped on to floor. Casters are standard. Shown with optional Scroll Trim detail at corners. Custom modificaitons available.